My plan of having a garden full of perfume throughout the year is beginning to come together. For some time I’ve been making a conscious effort to buy plants, bulbs and seeds that have a strong, pleasant perfume, hence the wisteria, roses, evening primrose and lilies. At this time of year, if you slowly walk around the back garden on a calm evening – when it’s not bucketing down with rain – you’ll pass through clouds of perfume created by the gorgeous Lilium Regale or the Regal Lily. They are dotted about the garden so you’re never too far from one. Pockets of incredible lily fragrance wafting in the air, waiting for you to take a sniff; it’s such a delight that I’ve also taken to cutting some of the flowers to bring inside and enjoy. Hi Sunil – Well, she’s a beauty, and no mistake! I like things that smell nice in my garden too, although I lean towards “small” flowers (the plant itself can be big), so lavender, forget-me-not, cat mint, Russian sage, are things that smell good with small flowers. I have just removed a large shrub as it has come to end of its life, and there, in the middle, a Rosa Glauca – 6 feet high, and a bit “leggy”, but deserving of it’s place in the garden. Possibly seeded by a bird, as I definitely didn’t put it in….. just thinking of what kind of support for it now. Picture on my blog tomorrow. Ah, looks wonderful. How does it compare to ‘Casa Blanca’ as far as fragrance goes? 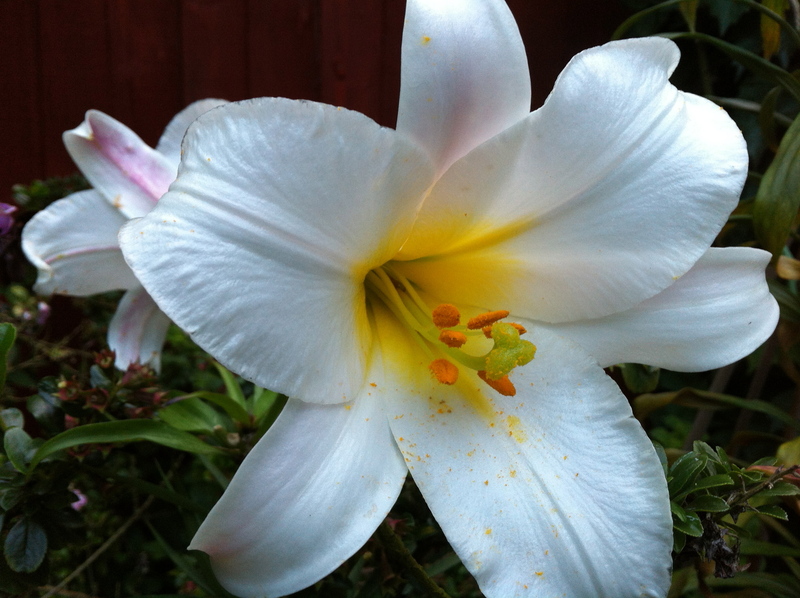 We don’t have that lily in the garden, and I’m trying to remember if I’ve come across it at work (reception flowers). It looks somewhat familiar – and stunning. Quick answer is I don’t know, but I’m sure the Casa Blanca and Regale together would be a knock-out scent. I have a dream for a future garden outside my bedroom that will be full of fragrant plants. I gave up on lilies a number of years ago — between the predations of the red lily beetle and the deer who nipped off the buds, hardly any ever got to bloom; but I do have a number of fragrant daylilies in bloom right now. If I were to try lilies again, Regale looks wonderful (as would be Casa Blanca, which my mother grew and which has a wonderful fragrance). That sounds wonderful. It’s a shame that the odds are against the lilies but there are lots of other fragrant plants that might withstand the deer. I’ve also suffered a little from Red Lily Beetle, but I have been regularly hunting them out and destroying them before they destroy the lilies and I haven’t seen one for quite a while. The battle has now moved on to the slugs that have suddenly appeared en-masse with all the wet weather we’ve had.